Members of the Kiama LGA have featured prominently in this year’s Kiama Electorate Community Recognition Awards. In a change of format, all this year’s nominees were recognised with an Award rather than being judged by a panel. Belinda Brooks of Kiama and Janet Poppett of Gerringong were recognised as Outstanding Citizens. Both are involved in a number of community activities. Most particularly Belinda for her advocacy of women with disabilities being recognised for their courage and achievements and Janet for her commitment to community fitness. In the Outstanding Local Volunteer category, awards were presented to Jackie Hall (Jamberoo Public School), Tricia Ashelford (Kiama Farmers’ Market), Geoff Shoard (Minnamurra Lions) and Christine Langford (Australian Centre for Leadership for Women). In the Junior Sports categories, Kiama’s Jackson Tikkeros and Kieran Woolley of Minnamurra were presented with the two awards of the day. Jackson is outstanding at a number of sports, including being selected for the Adam Goodes talented AFL program for the past two years Thirteen year old skateboarder Kieran recently won the Australian Under 16 Bowlriding title, and has been selected to join the skateboard training team for the 2020 Olympics. Rugby league legend Mick Cronin, who received a Sports Administrator award for his work with the Gerringong Lions, will be following their careers closely. Both Outstanding Young Citizen awards were won by Kiama students Henry Streamer and Bryce Humphries. Bryce, the immediate past Kiama High Captain, took time off from HSC exam preparation to accept the award for his excellent leadership; while Henry, amongst other things, was the Youth Member for Kiama in the recent Youth Parliament. 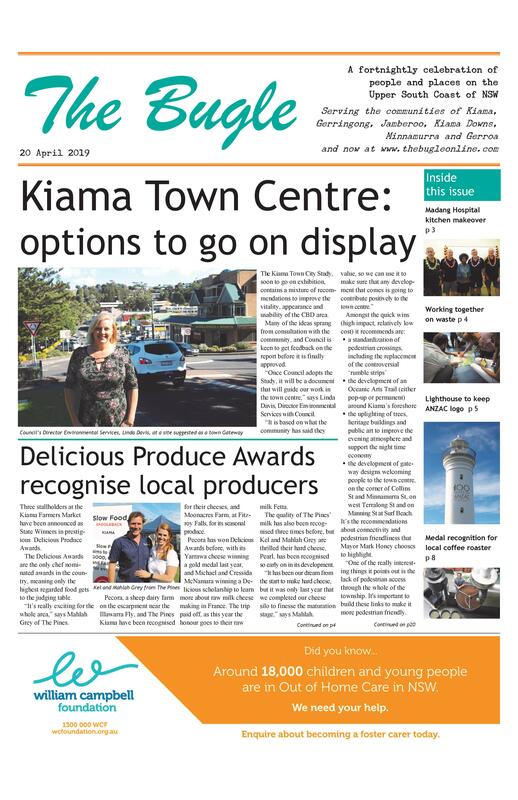 All of the nominees for Outstanding Small Business were Kiama businesses: Kiama Haircutting Company, Kiama Picture Company, Window Warrior, Endota Spa Kiama, Studio Fit 2533, Bean Roasted Kiama and My Room Kiama. The Member for Kiama, Gareth Ward, said, “Our community is renowned for its natural beauty but what I love most about our region is its people. Today we recognised and celebrate the amazing work of people who place service about self.